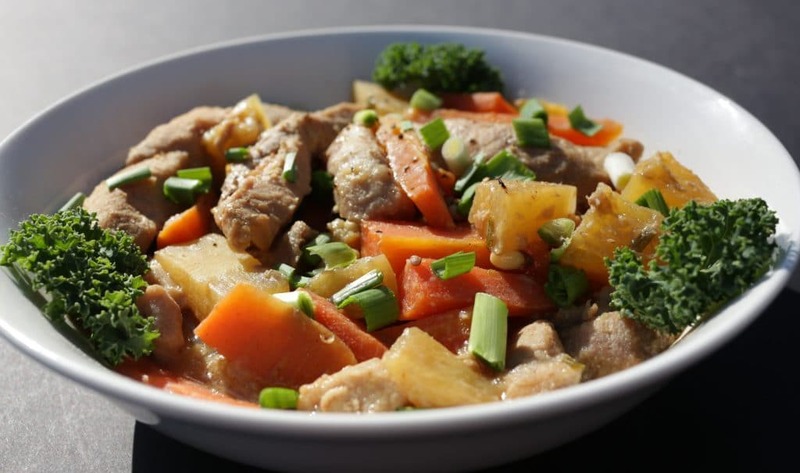 Crock Pot Asian Pineapple Pork is a low sodium meal full of delicious pineapple, carrot and pork. A homemade Asian sauce and fresh turmeric, garlic and ginger for some flavor and nutritional pop! Crock Pot Asian Pineapple Pork with fresh garlic, ginger and turmeric makes a flavorful healthy meal. I made this for dinner last night and it was VERY popular. For us, dinners like this one are exciting because we are using winter produce right from our garden. The garlic shallots and carrots wintered well for us. Indeed, the garlic is nearly weed level prolific! Dave made a gravel walking path around our raised garden beds with Evan yesterday. The garlic you are seeing in these pictures was volunteering right in the line of demarcation. So into the crock pot they went. The carrots are some short carrots from last fall’s winter garden planting that wintered very well. In the past the carrot varieties I’ve tried have been woody in the center after a winter season. These shorts are still really sweet and pretty tender. Happy us! I am growing turmeric and ginger in the greenhouse but neither is ready for harvest so the roots you’re seeing minced, above, are store-bought. I love cooking with fresh ginger, turmeric and garlic, they really add life to meals. Ginger is, or course a great add in for Asian meals, turmeric adds body and smokiness, young fresh garlic shallots are not too strongly flavored, so they make a nice garnish too! 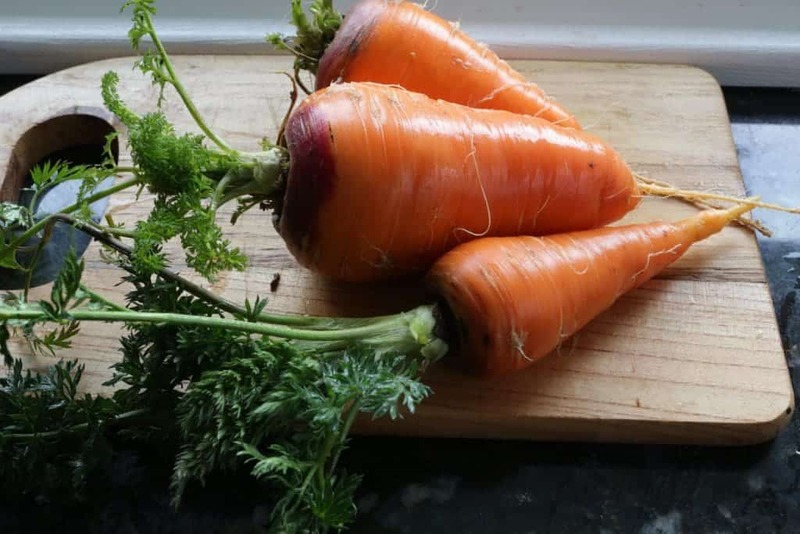 Last fall’s carrots wintered over with a sweet flavor and tender center. Over all, this meal was a great idea. The fresh pineapple chunks, veggies and herbs really made the strips of pork tenderloin wake up with great flavor. It you like, go ahead and steam some rice, quinoa, or noodles. This would pair well with any of them. I had some Chinese chow mien noodles so that added a nice bit of crunchiness into our dinner. If you are not familiar with Turmeric root check out this article from Healthline. Turmeric is a powerful anti-inflamatory savory food. I also love it’s smoky flavor in recipes. For example, I added turmeric to my Corn n Sausage Chowder for a nice smoky twist. If you get used to using this root fresh it also adds texture and little flavor bursts to your food I think you’ll like. Pork strips and the garlic, ginger and turmeric. I just threw everything in and stirred the pot. This is one of those quick and easy dinners I’m noticing a lot of on my blog. I’m pretty busy and often have just enough time to throw something in a pot and turn it on before I’m racing off elsewhere. I did make a nice Breaded Tilapia Parmesan dinner the other night if you’re interested in a meal with out a crock pot involved. It turned out fantastic! Cut your pork into strips. Stir your sauce ingredients together. Adjust the amounts of the hot sauce and other ingredients to your personal taste. Pour the sauce over the meat mixture and stir until all ingredients are lightly coated. Set your crock pot on high for four to six hours. Serve with Chinese noodles or over cooked rice if desired. I recommend the slow cooker function on high setting for four hours. Putting this recipe under pressure is problematic unless you use the pot in pot (due to it’s low liquid content). If you do the pot in pot method. Add 1 1/2 Cups water under the trivet in the bottom of your instant pot insert. Then add the inner pot on top of the trivet. 2 pots may be used to protect the veggies by using a stacked pot system like my ekovana pots. Put this recipe under pressure for about 10 minutes and let it slow release another 10. Be sure you slice up the meat thin so it is thoroughly cooked. 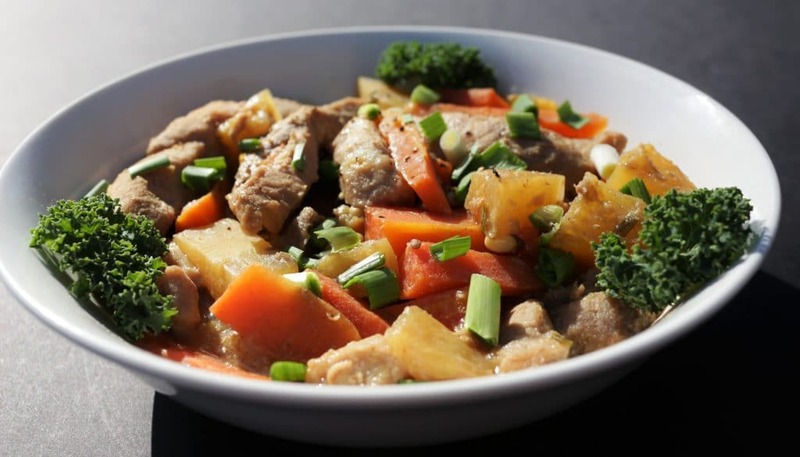 Crock Pot Asian Pineapple Pork is a low sodium meal full of delicious pineapple, carrot and pork. A homemade Asian sauce and fresh turmeric, garlic and ginger for some flavor and nutritional pop. If using an instant pot I recommend the slow cooker function on high setting for four hours. Putting this recipe under pressure is problematic unless you use the pot in pot (due to it's low liquid content). If you do the pot in pot method. Add 1 1/2 Cups water under the trivet in the bottom of your instant pot insert. Then add the inner pot on top of the trivet. 2 pots may be used to protect the veggies by using a stacked pot system like my ekovana pots. Put this recipe under pressure for about 10 minutes and let it slow release another 10. What a fantastic crock pot meal! I am featuring you this week at Simple Supper Tuesday. We hope you can join us again, starting Monday night at 8pm EST. Thank you Cindy! 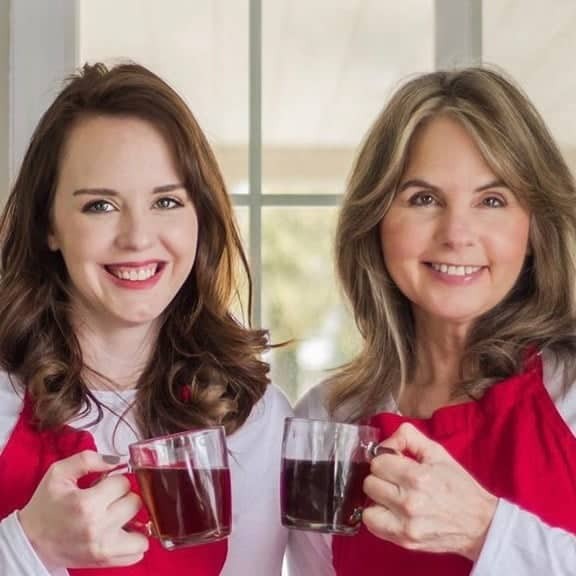 I’m honored to be featured by Simple Supper Tuesday. I’ll be visiting again! Diane this looks amazing, pineapple and pork just belong together in recipes. 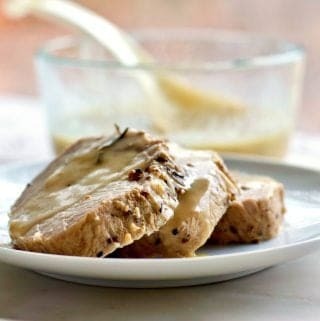 I would definitely not mind eating this, even though I usually don’t favor crockpot recipes, you may change my mind yet! Thank you Heidy! This is a yummy meal! I think this combo is right up my alley. It would be so delish with some quinoa mixed in. YUM! I think you would absolutely love it KC! G’day Looks delish This was one of my childhood faves! Thanks Joanne, Crock Pot Asian pineapple Pork is fast becoming a favorite at our house too!